Our culture and tradition were demonized. Our laws were seen as something coming from the table of barbarians and lesser humans. We were called pagans even when we have Eke-Kere-Uwa as our God. Our laws were discarded and foreign laws replaced with it. We started seeing foreign cultures as the ideal one. To be civilized for us as a people, is to embrace europeanism. We started belittling the man Afrika and moved to westernize everything hence, the birth of the superiority of white over black. Many Afrikans started turning their skins into white. White people manufactured high prized creams to this effect. Today Afrikans spend billions every year trying to change their black colour into white and with this the black man was completely defeated, both physically and psychologically. For many years till now, black countries remained desolate and blessed with puppets who front as leaders. Leaders who are warrant chiefs to the European powers. The European powers made sure thieves and killers of their own people remained in power, provided they are loyal to them. The European powers in turn provide aids to Africa after stealing them dry and supporting criminals as African leaders. What they cannot support in their own countries, they support in Afrika. Europeans keep encouraging rogues in Afrikan seat of power. That is why many Afrikan leaders till today will stay for donkey years in power, impoverishing their own people to the eternal gains of the Europeans. The journey to rediscovering Afrikans has started. The first step was taken sometime in Biafra in 1967, led by Odimegwu Ojukwu. The ingenuity of the man Afrika was laid bare. Fighter jets were manufactured, bombs and guns were produced for three years, in which they fearlessly matched against Nigeria with the combined international powers of Britain, Russia and Egypt. They proved that nothing is fundamentally wrong with the mind of blacks from the start of things. Today, from the rising sun, the people have completely rediscovered themselves and are seriously matching to freedom. 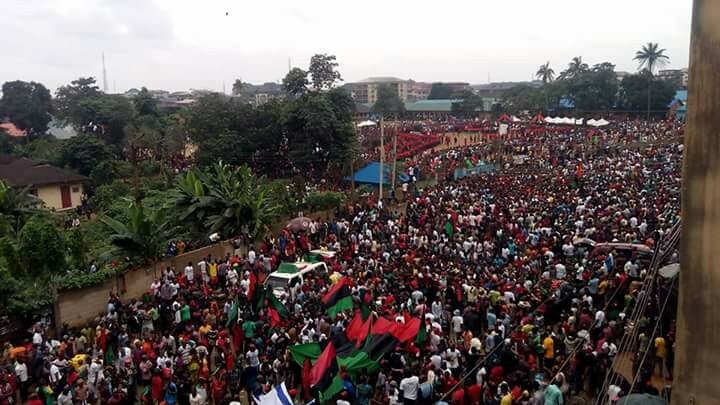 The Indigenous People of Biafra (IPOB) worldwide, led by Mazi Nnamdi Kanu is in the forefront of this move to freedom. They have fearlessly paid the ultimate prize in propagating the gospel of freedom to their people, who have been bartered by many years of lies from the caliphatic government of Nigeria and their agents in Biafraland. Biafra will return the dignity of the black Afrikans most assuredly. FROM THE TABLE OF THE BIAFRAN RABBI THUNDERS TRUTH,TRUTH AND NOTHING ELSE BUT THE TRUTH !! !